I was feeling guilty about wanting to paint yesterday, and I suddenly realized that it was because of the darned word count thing. So I am going to STOP the darned word count thing if it's going to make me *stress* about painting. A different kind of wisteria... less... patterned and less precise, I'll admit I got a little random, especially with the darker blue flowers in the bunches. 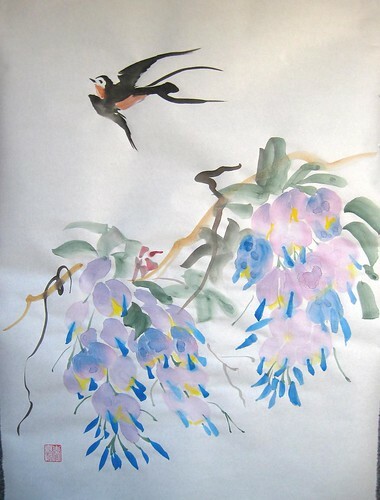 Mom gave me a different reference for a more "Chinese style" wisteria. I rather like it, but the differences are pretty pronounced from the other. I think that all the paintings are beautiful. *beams* Thanks. Woo about the parental reaction! That's very neat! Okay now I must admit that the bamboo one (while lovely) is lacking something. I don't know what, but it isn't as eye catching as it could be. However I loooove the top one. The birdy is beautifully painted. Hee. Did you see the iris on the meme I stole from you? 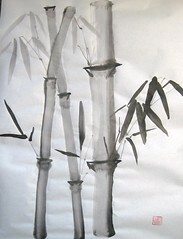 Well... black and white bamboo is tricky to make eye-catching. *laughs* The whole play of space and existence is just... odd sometimes. Glad that you like the top one! Thanks!! I can't paint or draw at all, so I can't imagine EVER being able to make it even remotely good. You do better than I ever will, THAT'S for sure. *laughs and hugs you solidly* I'm so glad you like it. I actually... am rather fond of the shadow leaves and the front palms of leaves, and the big stalk, for all I'm iffy about the placement, turned out nicely 3-D.
John likes it a lot, too. Hee. 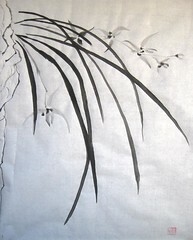 Hm, I see what you mean about the three bamboo stalks being so centered on the page, but their different sizes creates enough contrast that the symmetry isn't boring. The drybrush work on the thick stalk is particularly nice. I think the thing that sticks out for me about the piece is their order in the layer. The one which should be in the foreground by virtue of the way it's leaf falls feels receded because its detailing isn't as clear as the thick one. It's the same perspective perceptual illusion as how objects in the distance grow hazier and more diffused. The bird is really fun! I'll have to be sure to peer more at that next time, as I was kind of thinking of lightening the thinner ones to put them more in the background but hadn't quite thought through all the leaves, yet... Neat! Oh they're all so pretty!